Ultimate Fighting Championship (UFC) president Dana White says Khabib Nurmagomedov can’t sit out until October with his lightweight gold. Nurmagomedov was handed a suspension from the Nevada State Athletic Commission (NSAC) for his role in the UFC 229 brawl. While he was given a nine-month sanction retroactive to Oct. 6, he can cut the time to six months if he does an anti-bullying PSA. 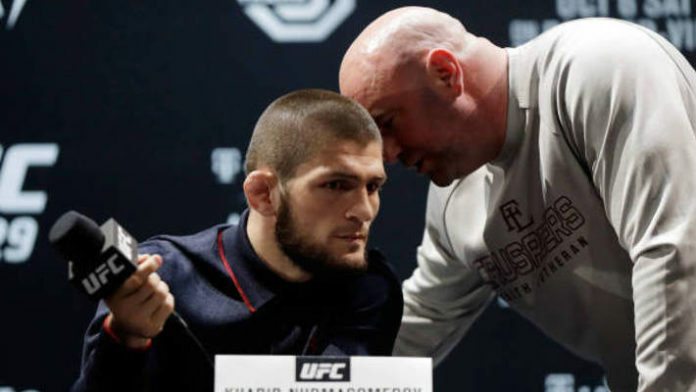 Nurmagomedov has made it clear, however, that he doesn’t plan to return until the suspensions of his teammates Abubakar Nurmagomedov and Zubaira Tukhugov are up. Abubakar and Tukhugov won’t be able to return until October. The good news for the UFC is that if they decide to move forward without “The Eagle,” they aren’t short of elite lightweights. There’s Tony Ferguson, Dustin Poirer, and Conor McGregor to name a few. Time will tell if the promotion has to go down that road. Do you think Khabib Nurmagomedov will return sooner than he wants to?